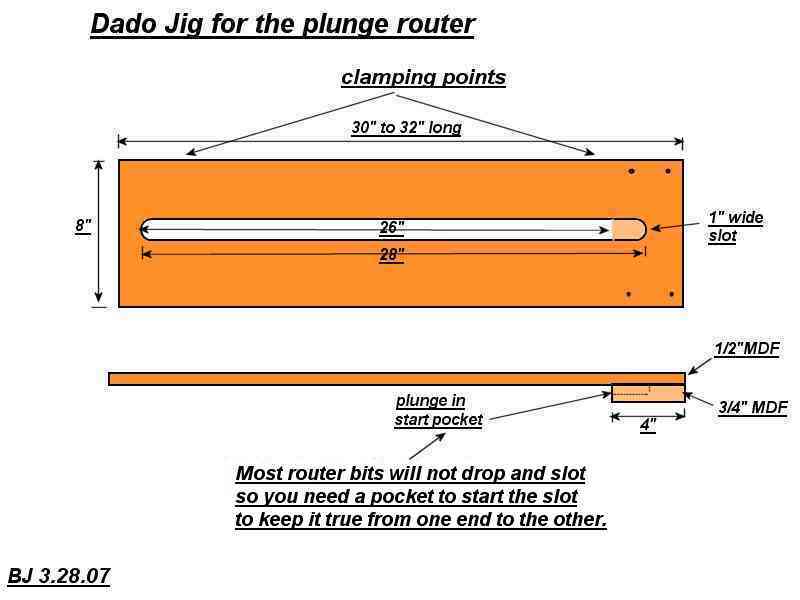 Router Forums > Router Forums > Jigs and Fixtures > Details of Dado jig please? Details of Dado jig please? Okay, I have my 1" cutter and brass template guide set. Am ready to make my dado jig. I have the photos Bob3 posted some time back. But I am not clear on how the jig is completed on the ends? Hard to phrase this question. But, okay....we have the long narrow piece with the 1" wide slot in it. Got that. But what is at each end? and how thick? Does it sit ON the work piece? I have a jig I've been using, the type where the router rides between the "rails", so to speak and it works okay. I goes OVER the work piece etc. Sorry guys, but I am just having trouble grasping the thing, even with the photos. I remember when the "single slot" plan was first posted I thought it was a GREAT idea and still do. I can DO dados with what I have, but the single slot appears to be much simpler AND probably more accurate. Thanks. Last edited by bobj3; 03-28-2007 at 09:45 AM. Thank you very much. That is precisely what I needed. And I had not thought about a "starter" pocket for the straight bit to get a grip. Will keep you posted. Appreciate the assistance. Last edited by bobj3; 03-29-2007 at 11:36 AM. This jig is basically a "T" square you make yourself. This one will accommodate a 4' dadoe. The first pass puts into the jig the exact groove. When inserting the panel, simply put mark on panel line up with groove, and set bar clamp so that the top bracket touches the right leg to keep it from moving. 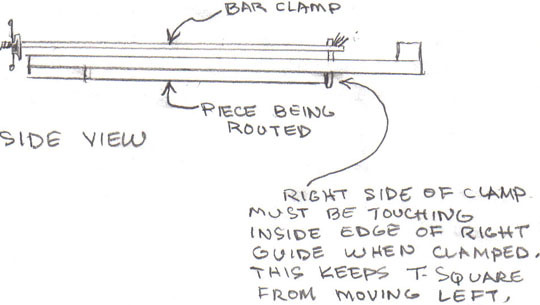 I've used this type of jig for over 30 years and it's a very fast set-up. It's accurate as all heck. Can do long or short runs. The panel in the picture is 18" x 18". It took me awhile to GET the clamp procedure... then it hit me... you're just clamping the workpiece to the crosspiece of the T square!! Ingenius!! I was thinking that a cabinet clamp like a Jorgy or Bessy might be easier to use... AND a piece of backerboard could be placed over the far end of the workpiece (where clamped) to reduce tearout... Yes? What do you think? 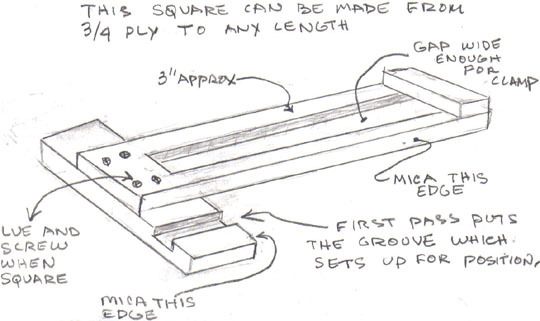 Does the router you're using have a square base to be sure it guides 'straight' along the jig side? ... or is your round base uniformly centered making it accurate in case the router got turned on the way across the cut? The NICE part being "line it up and cut" feature... saving time & being accurate! ... to say nothing about the unique way of clamping it!! Do I have your permission to add it to my web page 'collection'? It's very quick and really easy. I just got used to a bar clamp. They don't seem too bend under 5' long. A scrap piece at the head of the subject would help for tearout. I use a round base. Get kinda used to which way to hold the handles, and actually it's very centered. I usually leave one router with the bit that I used for the initial run that put in the first groove in the "T" part, set up just for dadoes with this jig. Last edited by Joe Lyddon; 04-26-2007 at 11:47 PM. Cabman's jig is one I built and I first saw this as one of Norm's jigs he used a lot. I need to make a new one! 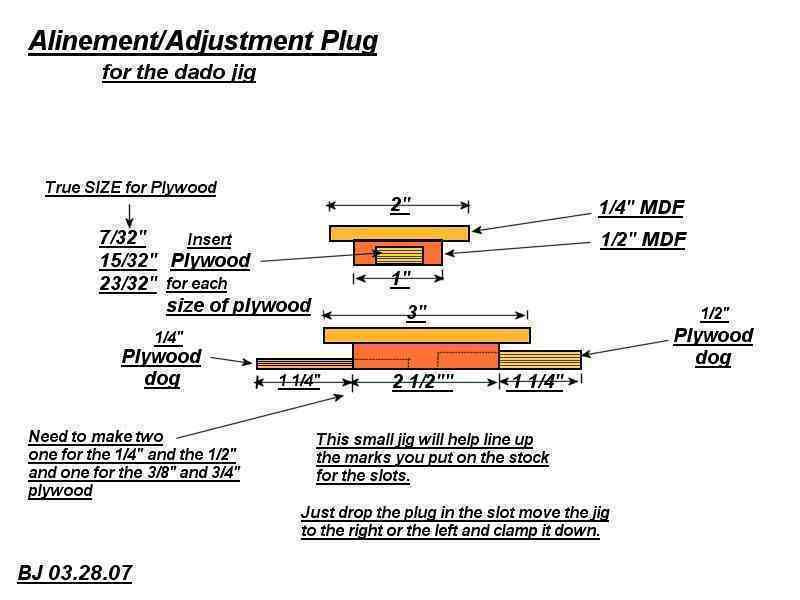 Of course this would be a non adjustable jig or in other words it won't work well with plywood due to the ever changing thickness of plywood. You really need an adjustable dado guide for that. I was going to try it... I think it would work... do you?